I hope its assumed that I care about and respect my clients — some of whom have minor life coaching challenges and some of whom have major mental illness challenges. I maintain this caring attitude, yet at the same time its possible to be overly politically correct and sappy sweet all the time — I try to avoid this and stay real. So what do you think about my latest marketing campaign? 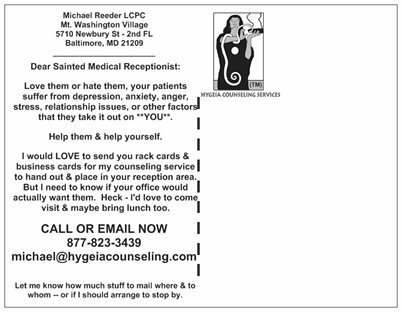 It’s aimed at medical office front desk receptionists in Baltimore, Maryland. As you might expect, receptionists are often a burdened group — if there is something to complain about, they are the ones who will hear it. 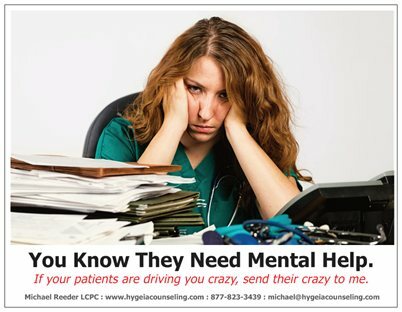 I’m trying to be funny and kind of shockingly edgy to get their attention — with the end goal being that they refer more clients to counseling who need it. Too many people take pills, see doctors, etc. but have no one to talk to. Doctor’s offices are kind of tired of hearing pitches and need a different angle of approach. So — looking at the postcards below — are these funny? Worth the shock to get more people help? Will these get my rack cards in doctor’s offices? Or is it disrespectful? Demeaning?